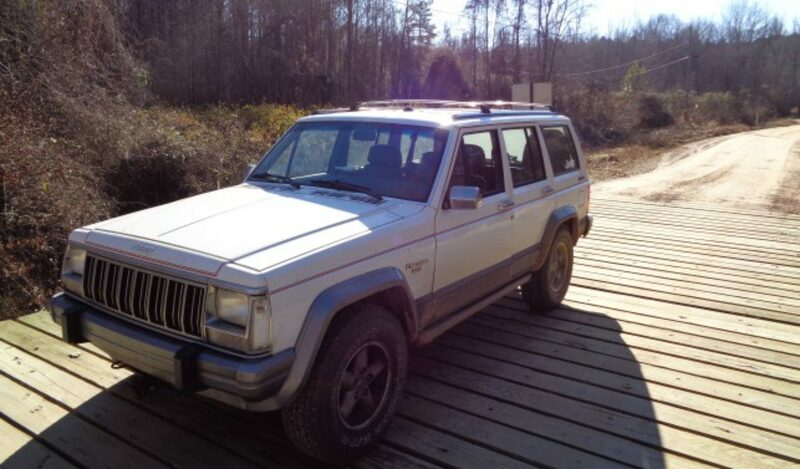 On the last couple of off road outings, I have had some trouble with my Jeep Cherokee overheating. Normally this Jeep has performed well with respect to heat so this was a surprise to me. For some reason, the coolant temperature switch was not bringing in the electric fan. Also, since I have disconnected the AC, I could not force it on by turning on the AC compressor. To get me through the day of wheeling, I ran a wire from the battery to the fan so that it ran all the time. While this kept me cool, it was inconvenient to have to open the hood and disconnect the wire every time I stopped for any length of time. Back at home, I wired up the jumper through a switch on the dash so I could easily control the fan. I connected the hot side directly to the positive battery terminal and the other side I spliced into the red wire going to the fan. This switch will cause the fan to run even with the engine off. It also bypasses all the relays and other parts of the circuit that might give trouble. The drawback is that the full fan current has to go through the switch. In order to have a more convenient way to power up the fan when before the temp switch kicks in, I also modified the AC control circuit. This circuit also brings in the fan when the compressor clutch is engaged. Since my AC is long gone, but the compressor is still there, I unplugged the clutch power and put a jumper in the low freon switch. So if I switch on the AC, the radiator fan will run. This way, I can have the fan switch on and off with the engine. Its excellent as your other articles : D, thanks for posting . “Too much sensibility creates unhappiness too much insensibility leads to crime.” by Charles Maurice de Talleyrand.